Retailers rely on wholesale sign & poster frames in order to display their printed graphics. These advertising fixtures can be used for promoting a new product or showing their products being used by people for the purpose of making a sale. Our sign & poster frames come in a number of available styles each with many different features. Most models feature the flexible mounting option of installing vertically or horizontally to the wall. Other sign & poster frames, including illuminated light boxes, can be installed hanging from a ceiling for display inside storefront windows. Whichever style you choose, remember that these displays for graphics come in all the standard sizes, from 18" x 24" up to 36" x 48". What are the differences between these picture framing models? 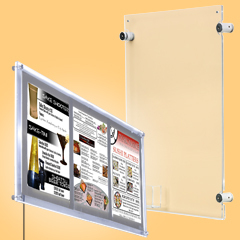 Sign and poster frames with snap open technology are the most popular style. Constructed from aluminum, these front-opening models allow for fast graphics changes without removing the frame from the wall. Good choices for the retail and food service industry. We offer a number of acrylic holders featuring frameless designs. These come with wall mounting standoffs and magnetic enclosures to seal the acrylic pocket shut. Light boxes draw attention with their bright LED or fluorescent illumination. While most models feature snap frame designs for inserting your graphics, the overall selection is the most varied. Choose from floor standing, wall mount, or ceiling hung styles. Let's talk about each model in greater detail. Snap open, or "quik clip" frames, come with clear non-glare lenses to protect your graphics. Each of the four frame edges flip open independently. 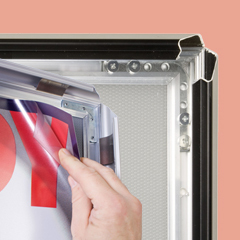 Once the poster is added and covered with the lens overlay, the sides flip shut in an instant. These styles are well suited for situations that involve constant graphics changes. The aluminum framing features anodized finishes, with black or silver being the most popular. Sizes range from small 5" x 7" sign holders up to very large 40" x 60" models. The acrylic plastic displays that mount with standoffs feature a laser-cut one-piece construction. Once the material is cut out, it's heat-formed into a "foldover", essentially an open pocket. Small magnets are embedded at the top corners to keep the pocket closed. Like snap frames, these styles allow for graphics changes while still attached to the wall. The standoffs lend a more modern and unique presentation for your inserts. Our light box category has something for everyone. 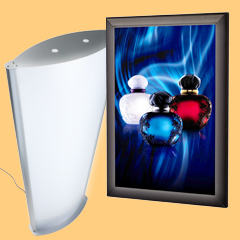 Base models offer wall mount illumination for generating marketing graphics that "pop". This effect is even more impressive when light boxes are mounted behind windows. To accomplish this, choose the ceiling-hung models in order to place the frames right up against the glass. Floor stands come in two varieties. The smaller versions, sized for 8-1/2" x 11" or 11" x 17" graphics, are ideal for restaurant menus. With muted interior lighting evident in may posh eateries, providing illumination for your menu would help potential patrons with their decision. The tall totem poster displays stand out thanks to their impressive height. Select the types that offer full length graphics or opt for an image-area on the top half only. Because these are free-standing, strategic placement becomes important to make sure people will see them. These wholesale graphics displays are an integral part of any marketing program. Buy in bulk to take advantage of our quantity discounts!